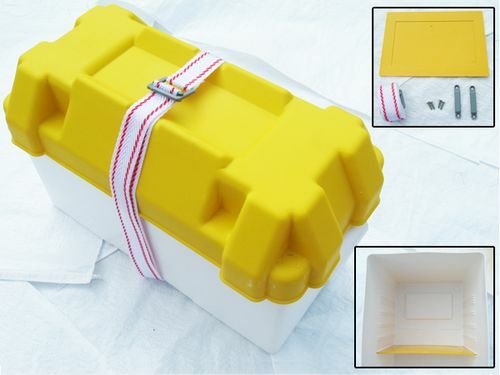 This Large Battery Box Is Great For Keeping All Types Of Batteries Out Of The Weather On Boats. Large battery boxes Ideal For Securing Leisure Batteries To Caravans,Boats & Motor Homes. Keeping your batteries safe and dry is of optimal importance in order to guarantee your safety, particularly if on a boat or surrounded by wet weather conditions. Here at SecureFix Direct, we have the perfect solution in order to keep your marine batteries and many other types of batteries out of sight and safe from the weather. This weather proof box that can face even the toughest of rains and thickest of snow, comes complete with a strap and buckle, two fixing brackets with screws and a plastic divider so you can create the perfect fit for the battery. The battery box has six partitions that the plastic divider can fit into so you can keep your batteries safe and secure, and unable to move. This battery box has a yellow lid with a white body so it is unmistakeable amongst your other boxes, so you can quickly and efficiently source the battery you need. Keeping your battery safe and dry is extremely important as wet batteries can increase the risk of a shock if they are touched when wet, and ensuring that they do not rust through contact with water guarantees that they will not leak. We supply a huge variety of marine accessories as a part of our range, and the battery box is the perfect accessory for any trip. Why Choose SecureFix Direct For Your Battery Box? We are determined to provide the best products at the most competitive prices. We ensure that all of our products are made of high quality materials so you can be sure to get a long working life from them. If you’re looking for somewhere to safely secure your batteries to protect them against the elements and simply for organised storage, then our large battery box is the perfect accessory for you. We offer a free delivery service with all of our products along with fast despatch so you can be sure to get your items as soon as possible. If you have any questions regarding our products, don’t hesitate to get in touch with a member of our friendly team today.